Trucks enter Turkey from Iraq at Habur border gate near Silopi, Turkey, September 25, 2017. ISTANBUL - President Tayyip Erdogan said Turkey may shut its border with northern Iraq “at any moment” after closing its air space to the region, Hurriyet newspaper reported on Thursday, reviving a threat first made after Kurds there voted for independence. “We have completely closed our air space to the regional government in northern Iraq,” the paper cited Erdogan as telling reporters on his plane returning from a trip to Poland. “Talks are continuing on what will be done regarding the land (border) ... We have not shut the border gates yet but this could happen too at any moment,” he added. 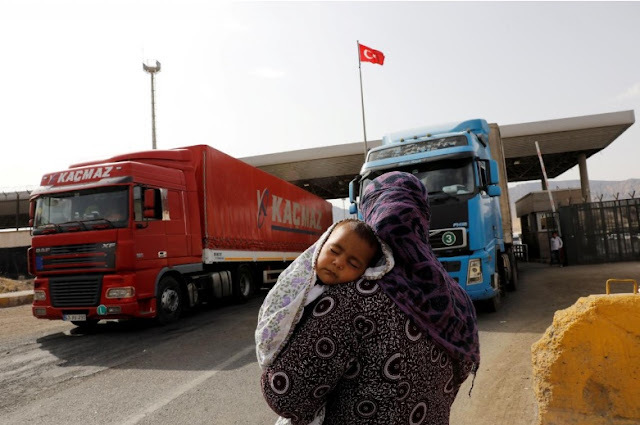 Turkey announced on Monday it was closing its air space to the semi-autonomous Kurdish region and said it would work to hand control of the main border crossing into the region to the central Iraqi government. The Habur gate is the main transit point between Turkey and Iraq’s semi-autonomous Kurdish Regional Government. A Sept. 25 referendum, in which Kurds in northern Iraq voted overwhelmingly in favor of independence, alarmed Baghdad, Iraq’s neighbors and Western powers, all of whom feared further regional conflict could arise from the vote. Subsequently Kurdish Peshmerga forces retreated to positions they held in northern Iraq in June 2014 in response to an Iraqi army advance into the region after the referendum, a senior Iraqi commander said on Wednesday. Ankara, which has been battling a three-decade insurgency in its own mainly Kurdish southeast, fears an independent Kurdish state on its borders would heighten separatist tension at home. President Tayyip Erdogan said Turkey may shut its border with northern Iraq “at any moment” after closing its air space to the region, Hurriyet newspaper reported on Thursday, reviving a threat first made after Kurds there voted for independence.